Even after gazing at it for like many minutes altogether, we have not been able to make our mind – is Navi really something very exciting or is it just a scooter bolted on a motorcycle-like frame! But what is clear is that – it is a relief from the tons of 110 cc scooters that look almost the same and we must give it to Honda for their innovation – they at least thought something different. So what is the Navi? How did it come to be what it is? We decided to find out more. At a recent press conference the members of the Honda management revealed to BikeAdvice that Navi was a target for them to create an affordable means of transportation which would cost less than Rs 40,000 and would not compromise on the fun factor. In fact the R&D team was not even specified whether to create a motorcycle or a scooter! So, they obliged and made a crossover-kind, something which is between a scooter and motorcycle! That’s not all, a senior member also let slip that Honda is now developing the Navi 2. While he did not reveal any more details about the ‘under works’ Navi 2, he added that with the Navi they are trying to create a new brand of two-wheelers where you can have a range of fun products. 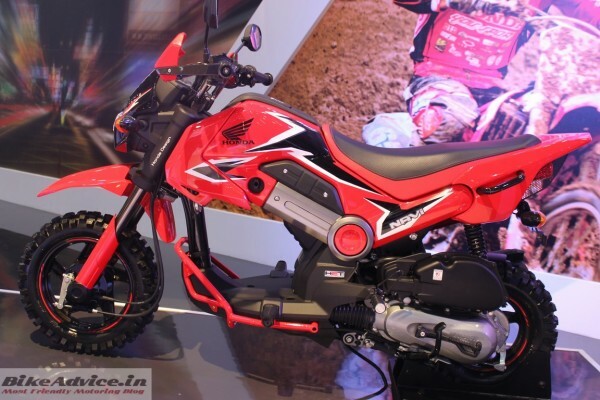 Navi 2 could be a new bigger engined version of Navi with the 125 cc mill from the Activa 125, or the same product with a manual gearbox, or probably the codename for the concept models showcased at the Expo. This is however for the first time the company has not kept a sales target in mind for a product. They want to create a new market and segment with the Navi. Targeting both young women and men from the age group of 18 to 24 years, Navi aims to create new additional value for the company.